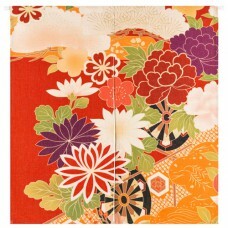 Noren (暖簾) are traditional Japanese fabric dividers hung between rooms, on walls, in doorways, or in windows. They usually have one or more vertical slits cut from the bottom to nearly the top of the fabric, allowing for easier passage or viewing. Noren are rectangular and come in many different materials, sizes, colors, and patterns. Japanese style noren door curtain in linnen. With seams.85cm x 90cm ..